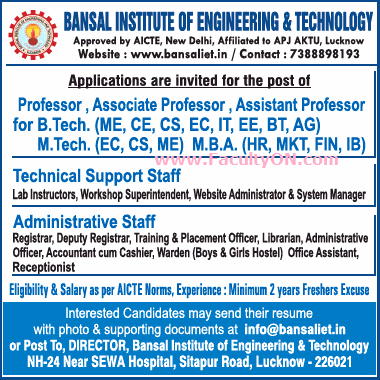 Bansal Institute of Engineering and Technology, Lucknow has advertised in THE TIMES OF INDIA newspaper for recruitment of Professor / Associate Professor / Assistant Professor Plus Non-Faculty jobs vacancies. Interested and eligible job aspirants are requested to apply immediately from 4th July 2018. Check out further more details below. About College: Bansal Institute of Engineering & Technology is managed by Bansal Educational Trust founded in the year 2007 and registered under the Societies Registration Act of 1860 with an aim of providing quality technical education. The Institute is affiliated to AKTU, Lucknow and approved by AICTE,.Ministry of HRD, Govt of India.